Everybody’s hands go UP!!! …and they stay there, and they say “yeah” and they stay there! No DJ Khaled and Ludacris fans in the house, I see. Actually, I don’t win, win, win all the time, obviously. We are probably even on the total of number of games won and lost between the two of us. 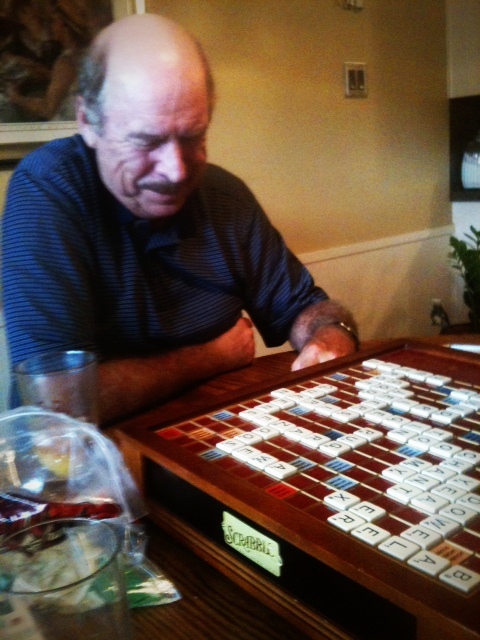 The deal with my Dad and I, though, is that we like to talk trash while we play Scrabble. Along with trash talking, we pretty much say the same things every game. Mostly, it’s him that says the same things over and over. It’s like there is a script he reads. When I was over at my parents’ house this week, I jotted that script down. My Dad wondering how to spell “it”. While waiting for my dad to play, I have the attention span of a gnat embryo. This will lead me to make really horrible faces to my Dad followed my questions like, “Would you love me if I looked like this?” followed by “No, Dad, this one is more awful. Would you if I did this with my lips and then this with my eyes? How about then?” or “Would Chris have stuck around if I did these two things to my face and then used this voice?” He always answers “no” to all of my questions. My attention span is really taking a hit about this point. So many of the letters have been played that all is left is a 3×3 space to play these letters: F W U A I I I . Instead of making a decision, I will take this opportunity to modify any song to feature Scrabble issues. This past week it was Rod Stewart’s song that got the hatchet. “Some guys have all the vowels. Some guys have all the As. Some guys get all the breaks. Some guys do nothing but complain!” to which my Dad will eventually reply, “Alright, already”, especially when I really, really get into the “ooo-ooo-ooo-ooo-oooo” part after that verse up there. of course. It’s a Russian dinosaurjustkidding. I’m sure my script has some holes in it, but I think you get the gist of our little Scrabble movie. 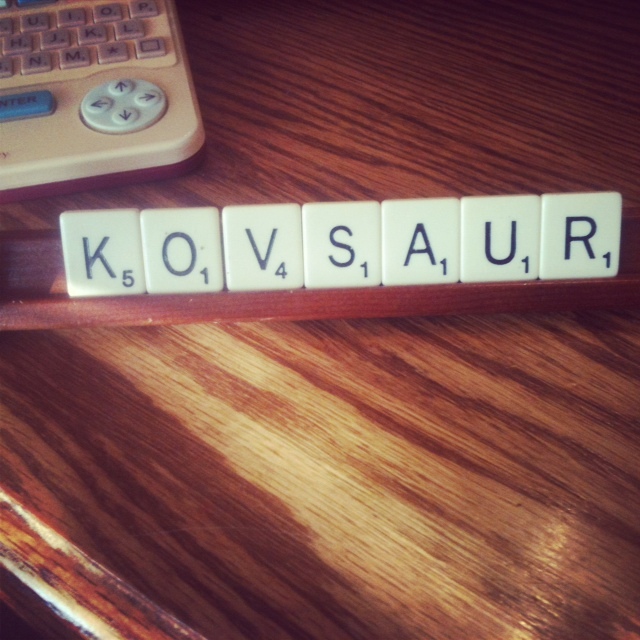 Seriously, though, I cherish this time playing Scrabble with my Dad. I know life is precious and that many of my friends don’t have their dads with them anymore. That hurts my heart. So, when he asks if I will still play him even when he’s gumming down the Malt-O-Meal at the nursing home and can’t remember how to spell, I say I will. Anna and I love hosting this “Finding the Funny” party and are happy that you stop by each week to share past or recent humor posts of yours. When I see a new face, I do split leaps! When I see an old face, I do split leaps! I love split leaps! But, seriously, thank you for stopping by. It means tons. Oh, and, ummm…could you help a sister out? I’m at 666 followers on Google Friend Connect. Satan is not welcomed all up in the Break Room and I feel like he’s sitting there staring at me every time I start dusting the Break Room furniture and begin wiping down that orange chair with my Clorox Wipes! Could I get one person to like it for 667? Going once! I’ll tell you what, every person that follows my blog via GFC today (667+) will get a special shout-out on my blog tomorrow! How about that! LET’S BEAT SATAN TOGETHER, FOLKS! Anna and I are looking for a few volunteers to help with Finding the Funny. We always share the top 5 most-clicked links – but we want to hear what YOUR favorites are. We’d like to invite you to join us for one week and share your favorite posts that were linked up to Finding the Funny. We’ll share the most-clicked links, and then we’ll send everyone to your blog to read your favorites. If you’re interested, let me know in the comments or send me an email at kelleysbreakroom@gmail.com. Looking forward to hearing from you!